Homepage. This page: A rubber car accessory from the pre-war years. The John Bull firm is perhaps best remembered by motorists and cyclists alike for their range of puncture repair products. Somewhat more unusual however is this little item, that measures approximately 4.5 inches in height, and is made entirely of rubber. 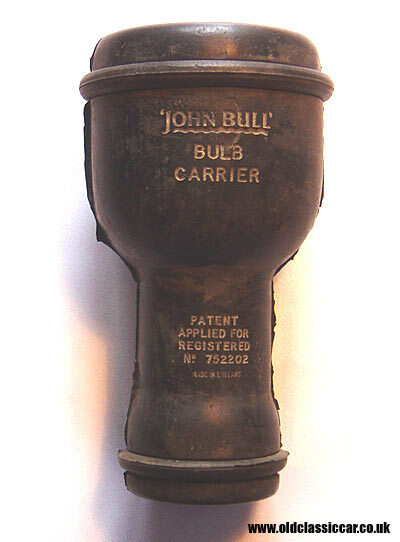 It was known as the 'John Bull' Bulb Carrier, and must date to the 1920s or 1930s. Patent protection had been applied for, according to the information pressed into the rubber housing, so John Bull must have been concerned that others might copy their design. The body of the bulb carrier is in two pieces of formed rubber, held together by stretchy rings at the top and bottom, and bonded in the middle. Peel off one of the rubber rings and you can pull the two pieces apart, enough to withdraw a bulb. Housed within the wide end of the unit is a glass headlamp bulb, cradled within a formed void to protect the bulb from damage. At the base of the bulb carrier is a small side light bulb. There doesn't appear to be any provision for mounting this unit on the bulkhead or dashboard of a car, so I assume it would have been stored in a toolkit, or perhaps on a glove tray within the car. I've never seen one of these before, but when I did I thought it'd look quite nice in my 30s Austin. Return to my motoring gadget page within the vintage car accessory section at oldclassiccar. A cracking illustrated invoice from a supplier of John Bull Tyres, can be seen here, in the motoring collectables section.